ISIS exposes new satellite imagery which suggests that additional suspicious activity may be occurring at the Parchin site in Iran. 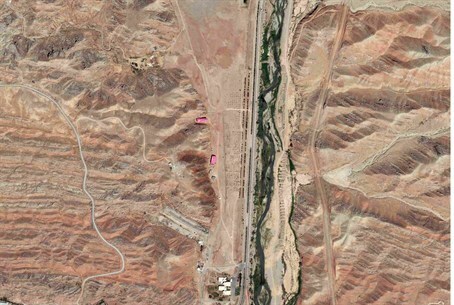 A new satellite image suggests that additional suspicious activity may be occurring at the Parchin site in Iran, according to a Friday report by the Institute for Science and International Security (ISIS). The new GeoEye image dated August 15, 2012 shows that additional suspicious activity may be occurring at a building suspected of housing high explosive experiments related to the development of nuclear weapons and at an adjacent, northern building that may have also hosted suspect activities. In an August 1, 2012 report, ISIS assessed that apparent cleanup activities at Parchin were complete, because imagery showed what appeared to be the final result of considerable sanitization and earth displacement activity. The latest satellite imagery clearly shows the suspected high explosive test building covered in a pink-colored material. A comparison with previous satellite images of the building, ISIS noted, shows that the size of the now covered building has visibly increased, especially in its height. In consultation with experts ISIS said it believes that the covering tarp is supported underneath by scaffolding which would account for the increase in size as well as for the horizontal lines appearing under the tarp. Similar activities appear to be taking place at the northernmost building at the site, the report added. Currently only part of the roof appears covered by the pink-colored tarp; however, similarly colored material is visible on the ground next to the building suggesting that it may soon be covered. The purpose of covering the buildings could be to conceal further cleanup activity from overhead satellites or to contain the activity inside, the report noted. Depending on how effective of a seal the tarp provides, the goal could be continue sanitizing the inside and outside of the building that is suspected to contain particles indicative of nuclear weapons development work. Alternatively, ISIS said, tarps could provide a cover for the demolition of the buildings, or portions of them, while also containing the spread of potentially contaminated debris. A June report by ISIS indicated that Iran is continuing its suspected clean-up activity at the Parchin military complex. ISIS presented satellite imagery from June 7, 2012, which shows continued activity at the site. The image shows heavy machinery tracks and earth displacement throughout the site. Satellite images taken at the end of May and exposed by ISIS confirmed the destruction of two buildings that inspectors from the International Atomic Energy Agency (IAEA) have sought access to. Iran has refused to allow IAEA inspectors access to Parchin. Another round of talks in Vienna between the United Nations’ nuclear watchdog agency and Iran on an agreement which would see the IAEA entering sites of suspected nuclear activity in Iran ended without progress on Friday.